The (extensive) set of application settings can be accessed vie the Menu Edit→Settings from the main menu and adjusted within the dialog window. 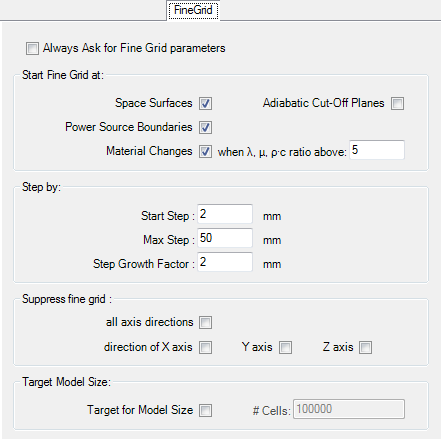 Settings shown and adjusted in this window are applied to the application and are independent from project specific parameters (compared to current fine grid parameters of the project, for example, saved with the project). Changes to some parameters require an application restart (e.g. User interface language) - if so it is emphasized in the description specific parameter. Parameters which are composed of a set of detailed settings are shown with a plus symbol to the left of the parameter name. A click onto the plus symbol will expand the list of detailed setting offering them for editing. The bottom part of the window displays the description of the parameter currently selected. The height of this part of the window can be adjusted by dragging the splitter bar. Every change to the settings are applied immediately (eventually requires application restart too). The button "Close" or ESC-Key close this window. Relative Close-Up Error limit Relative Close-Up Error maximum criteria for coupling coefficient determination. The value set here is used to show precision missed marks (*) and (**) within the coupling coefficient precision information. Remark: Further precision analysis of the calculation shall be considered if current error values are above this limit. Relative Close-Up Error - Warn if above Display a warning message if precision criteria (limit for the relative close-up error of all boundary conditions) is not fulfilled. Standard Boundary Conditions Default values of boundary conditions (temperature and relative air humidity) for the evaluation. These values are used only during the first evaluation of a project. Spaces are sorted alphabetically by their name. All but first space will receive these values by default. First space will be assigned its specific values. Remark: Relative humidity values apply only to evaluations of vapour diffusion calculations. These default values can be set only if DAMPF2/3DIM license option is available. Remark: If the project template "projekt.xml" contains boundary conditions already, that will have the priority over the values specified here. fRsi,min design factor for condensation assessment Minimum value fRsi,min of the temperature factor of interior surfaces for the condensation-free assessment (within results report). Undercutting this value should mean that condensation free assessment criterion of interior surfaces is not fulfilled. Important: The value fRsi,min is dependent on interior climate (temperature, air humidity) and can be referred within local regulations. fRsi,min design factor for mould-free assessment Minimum value fRsi,min of the temperature factor of interior surfaces for the mould-growth-free assessment (within results report). Undercutting this value should mean that mould growth free assessment criterion of interior surfaces is not fulfilled. fRsi,min design factors - Warn if undercut Display a warning message within results report if mould- or condensation-free criteria is not fulfilled (fRsi,min design factors are undercut). fRsi - Two-Space only evaluation Evaluate fRsi temperature factors (within results report) only if exactly 2 spaces (temperatures) and no further boundary conditions exist in the model. Always Expose Graphical Evaluation The graphical evaluation window (Results 3D window) will be opened automatically each time boundary conditions are applied. 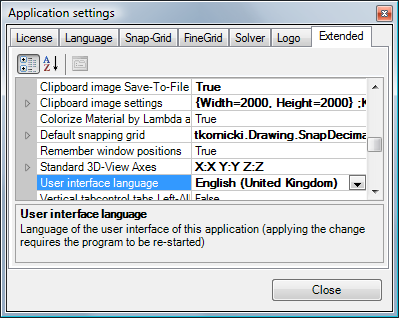 If this setting is turned off (False) the graphical evaluation, if not opened yet, will be not initiated - computationally very intensive and memory consuming evaluation is not requested. Only the results report will be created and exposed. Evaluate secondary functions Secondary functions (like heat flux, relative surface humidity, etc.) will be calculated for graphical evaluation. If this setting is turned off (False) only temperature field will be calculated for Results 3D evaluations. This saves significantly time needed for calculation and reduces memory demand during evaluation. 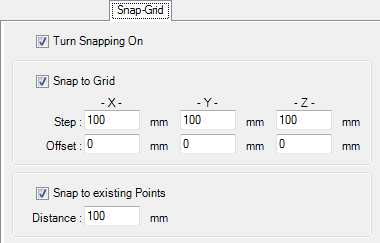 Allows selective selection of secondary function to be calculated for graphical evaluation. This provides the ability to evaluate only needed functions by simultaneously reducing the memory demand and calculation time otherwise spent for functions the user is not interested in (surface humidity, heat flux, heat stream vector field, saturation pressure etc.). Remark: Application settings specific to the VAPOUR-Option (partial pressure, pressure difference, interstitial core humidity, vapour flux and vector) can only be changed if the DAMPF2/3DIM license option is available (otherwise are shown as Read-Only). Remark: This setting is only meaningful if the setting "Evaluate secondary functions" is turned on. Default: By default all secondary functions are evaluated. It is advised to turn off evaluation of not used secondary functions to reduce the computational time and memory demands. Restore last Result3D Parameters Defines how (and if) to restore the Results3D Parameters on first display of the Results3D window (the combination of evaluation parameters is saved when the Results3D window is closed). No - parameters will not be restored; predefined default combination of parameters will be used. Restore - exact combination of parameters will be restored; some restored numerical values might not be suitable for the model currently evaluated. RestoreAdapt - combination of parameters will be restored and some numerical parameters will be adjusted to reflect currently evaluated model (e.g. Tube Radius etc). Colorize material by Lambda automatically Defines if the material colour is automatically calculated and changed then the value of Lambda changes (by LambdaToColor-Table). When off the colour assigned to the material will be retained during changes to the value of Lambda. Clipboard image size Dimensions (in pixels) of images shot from 3D views and placed onto the clipboard (via Copy Image). Please keep proportions (width/height) of the image targeted for the clipboard same to proportions of the view on the screen. If proportions differ the resulting image placed on to the clipboard will probably differ (in its scaling) from the view seen on the screen. Clipboard image Save-To-File option Defines if after copying the image onto the clipboard an option to save the image to the file (Save Image dialog) shall be offered also. Remember window positions Positions of windows on the screen shall be saved and windows shall reopen at positions saved lately. User Interface Language By default the user interface of the application reflects the language of the operating system (standard/default language). The user can change this setting! If the language setting is not supported by the application (current distribution provides only English and German), the application will fall back to English. Vertical tabcontrol tabs Left-Alligned Tabs of the control panel within Results3D window will show at the left edge of the window (instead of the default at right side). This setting allows to change the placement of tabs to the left side of the window which might be common to architects and engineers. This reflects familiar tilt of the head to the left to read tab labels. Vertical tabcontrol tabs with Icons Tabs of the control panel within Results3D window will show graphical symbols also. Reopen last project The last project saved or opened prior to application exit will be reopened automatically on next application start. Overwrite project without asking The project file will be overwritten without any warning or approval (only if the name for the project file is already set). If the name of the project file is already set (either saved or loaded) saving the project is executed without any additional warnings. This simplifies the step „Results…“ – when combined with AlwaysAskForFineGridParams=FALSE and AlwaysAskForSolverParams=FALSE the application shows results directly. Always Ask To Save Project You will be reminded to save current project prior to any destructive operations (this the default behaviour). Prior to disposing data of current project (New, Load, Convert etc.) the user will be asked to save the project. Answering "No" will continue with the operation requested without saving the project (which potentially result in losing current project data). Answering "Abort" will immediately cancel the requested operation. Create Directory For Reports When creating a new project, create a directory where the reports and related images are stored. Always ask for fine grid parameters User will be asked to adjust and confirm fine grid parameters (the dialog Fine-Grid parameter will be shown) on each computation. Automatically close Solver Form The Solver window will close automatically when the computation is finished. If this setting is turned off (False) the application will wait until the user manually closes this window (by pressing the button "Close"). Keeping the window visible can be helpful when further detailed analysis of messages produced by the solver is required (e.g. at some error conditions). Animate Progress on Solver Form Show the progress animation on Solver window. If this setting is turned off (False) the animation will not show thus saving CPU time. Always ask for Solver parameter User will be asked to adjust and confirm Solver parameters on each computation (the dialog Solver parameter will be shown). Default Solver parameters Default values of parameters used by the simulation engine applied to new projects. Run Solver On Multiple Processors Run the Solver utilizing multiple processors or processor kernels. The maximum number of processors utilized is set with the parameter "Max Number Of Solver Processors". Remark: This setting can be changed only if there are multiple processors (or processor cores) available in the system used. Remark: This setting requires a valid license feature MULTICORE. See also: application setting "Option MULTICORE active". Default: On (subject to license feature MULTICORE and the OS reported number of processor above 2). The user shall adjust the Number Of Solver Processors to achieve optimum performance. Max Number Of Solver Processors The Maximum Number Of Processors utilized by Solver (if it shall run on multiple processors). The number entered is limited to the actual number of processors (or processor cores) currently installed and available in the system. The user shall adjust this number to achieve optimum performance. 0 (default) - utilize all available processors/cores. Warn on excessive Equation Size Display a warning message in the Solver if the equation size is above the value specified (0 - disable warning). Simulation Folder Cleanup (Reminder) Set the number of days after the latest invocation of the Simulation Folder Cleaner Tool to remind you about the cleanup of intermediary simulation results eventually needed. If you ignore the reminder when shown, the setting is raised by 1 automatically. User specific Logo Path to the User specific logo file. The logo image is displayed in the heading of reports, as middle item of the heading, placed left to the Copyright-Info, 6cm wide and 1.5cm high. To avoid distortion of the picture keep the width to height ration of 4:1 (for example 800x200 pixels). If no logo image shall be shown on reports leaving this field empty is allowed. Default project directory The Path to the folder to which project files shall be saved. This setting is only used for dialogs of save/load menus if the project currently processed has not been saved to file ever yet (this is valid for new projects). öbox data download folder Path to the store of öbox-data which then are shown within material database window. baubook(öbox) data included Include baubook(öbox)-data (if available) within material database window. This, if turned off, allows you to exclude baubook(öbox)-data from the view even if the baubook(öbox) data file is available. You will have to close and reopen the material database window to fully apply change in setting of this switch. BPHDB.COM data included Include BPHDB.COM data (if available) within material database window. This, if turned off, allows you to exclude BPHDB.COM data from the view even if the BPHDB.COM data file is available. Settings collectively grouped here are used to adjust behaviours and techniques used by the program. Such special adjustments must be accounted also to reflect various differences in hardware used, which cannot be automatically analysed and might lead to undesirable behaviour of the application. Alpha (surface transmittance) hidden Hide the Alpha field (surface transmittance Alpha=1/Rs) within space surface property input. When turned off both reciprocal inputs of surface resistance Rs and transmittance α are offered (compatible with versions prior to 6.102) on Element Editor and Surface Editor forms and reported on Modelling Report. Elements23Form Panel Contents Contents shown within quadrants of Elements23 window can be adjusted and contain choices of parallel projections XY, XZ, YX, YZ, ZX, ZY, the 3D view and element selection list. One can also do without showing anything within quadrant (in most cases the 3D view might be obsolete). 2D-Project Defines which Editing windows will automatically open for 2D project. 3D-Project Defines which Editing windows will automatically open for 3D project. 3D-Layered-Project Defines which Editing windows will automatically open for layered 3D project. Restore last Camera Position Restore to the recent Camera position on initial display of a 3D window (applies to Elements3D, Elements23, Results3D). No - position will not be restored, only Fit (center, scale); predefined default position will be used. Restore - exact position of the camera will be restored; might not be suitable for the model currently evaluated. Show using Visual Styles When enabled Buttons and other controls will render with (new) visual style, e.g. rounded. You will have to end and restart the application to consistently apply the change of this setting. Remark: For Windows XP the default is "Off" to overcome some compatibility issues resulting from implementation error on that systems when showing text on vertical tabs of the tab control which are not rendered properly if visual styles are enabled. The user can still enable that setting manually. Help Window shown TopMost Help window will be shown topmost to application windows and automatically minimize with the application (this is the windows default behaviour). When turned off (the default) the help window can be set behind the application window via typical desktop window manager. Remark: It applies only to Help.ShowHelp but not the HelpProvider (invoked via F1 key) thus the effective behaviour depends on how the help window was opened. If HelpProvider opens the Help window (user pressed F1 key) then the default (TopMost) behaviour will be always retained. If Help.ShowHelp opens the Help window (via Help-Contents, Tutorials, etc.) then the behaviour set here will be retained also for subsequent F1 requests. Alternative License File AnTherm.HID Alternative path to the store of the license file AnTherm.HID. Important: This setting, if not empty, takes precedence over the "Alternative list of license files AnTherm.HID". If left empty (default) the license file AnTherm.HID is looked for within the installation folder, and, if not found there, within the subfolder DemoLicense of the installation folder. Important: A valid license file MUST be named AnTherm.HID. AnTherm will create a temporary local copy of the file provided to also allow network stores without additional performance penalties. ZIP Archive: specifying a ZIP archive storing the license file AnTherm.HID in its top level directory is also supported. If the file specified does not exist, this setting is simply ignored. Important: You will have to end and restart the application to consistently apply the change of this setting. 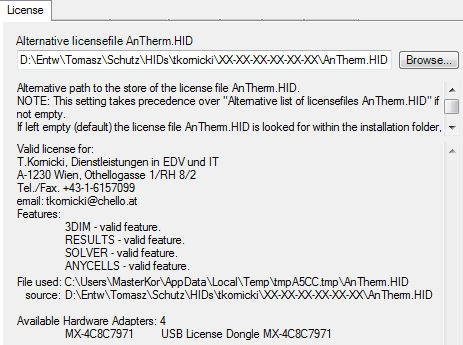 Alternative List of license files AnTherm.HID The list of alternative paths to multiple stores of license files AnTherm.HID of which the first valid or first marked expired will be employed. Important: The setting "Alternative license file AnTherm.HID", if not empty, takes precedence over this one (which then will be ignored). The name of a ZIP archive storing the file AnTherm.HID can be set alternatively too. Remark: The purpose of this setting is, in the case you have multiple license files bound to different hardware identifiers (e.g. dongles), eventually with varying functional scope. Switching the dongle the first license file matching it will be validated. Asynchronous Evaluation Builds Turn this setting off to force the application to execute all its parts sequentially (otherwise executing in parallel and possibly utilizing multiple CPUs if available) on weaker computer or for testing purposes. Windows mode MDI Show windows in MDI mode (you will have to restart the application to aplly this setting). SDI: While in non-MDI mode (WindowModeMDI=false, also called "SDI mode") the height the main form will be reduced to lowest possible size to show the main application menu only. The main window will be declared as "Top-Most" ensuring its visibility on top of all other application windows to avoid hiding of the main application menu. Fade Info-Dialog Gradually The About dialog shall appear by decreasing its opacity in small steps. On some (older) machines this might result in undesirable flickering effect, thus this setting can be turned off if such behaviour is observed. Multiple app-instances allowed Simultaneous execution of multiple instance of this application can be allowed by turning this setting to on. This might be useful when components or their parts shall be quickly transferred between projects via clipboard (copy/paste) without the need to close the active project and open another one in between. Warning: Simultaneous execution of multiple instance of this application might result in race conditions between instances and lead to severely erroneous results. You shall never edit same project originating from/in the same directory simultaneously or otherwise the application will behave unexpectedly. Remark: This setting requires a valid license feature DAMPF2/3DIM. Option HARMONIC active The HARMONIC option can be turned off by the user. Remark: This setting requires a valid license feature HARMONIC. Remark: Suspending HARMONIC option turns off the TRANSIENT option too. The SolverParamsControl will limit the number of harmonics to 6. Remark: This setting requires a valid license feature HARMONIC/TRANSIENT. Remark: Turning the TRANSIENT option ON turns on the HARMONIC option too. Option MULTICORE active The MULTICORE option can be switched off by the user. When deactivated the optimized execution of calculation (Solver) and many further evaluation components of the application will be suppressed. See also: application settings "Run Solver On Multiple Processors", "Max Number Of Solver Processors". Option STEREO3DVIEW active The STEREO3DVIEW option can be switched off by the user. When deactivated stereo rendering capability of 3D windows will not be available. You will have to close and reopen all 3D windows to fully apply change in setting of this switch. Lately used Settings File The path to the settings file loaded lately (read only, for information only). Remark: Changes to settings in this group require all 3D-windows to be reopened or the application to be restarted to apply them. ToPolygonOffset This setting ensures enhanced visualization of lines drawn along surfaces. When turned off lines (e.g. isolines, edges etc.) will be drawn coplanar to surfaces, possibly leading to undesired visual effects (e.g. lines only partly visible, partly obscured). On some weaker graphics systems (e.g. DELL Lattitude D505 with Intel Extreme Graphics 855GM) this setting might be turned off or otherwise rendering of surfaces is not correct. UseBackingStore Turn on/off using backing store. This may cause the re-rendering time to be slightly slower when the view changes. But it is much faster when the image has not changed, such as during an expose event. Remark: On some systems it undesirable to turn this option on - areas of covered partly by other windows might not be redrawn correctly during normal rendering. Rendering Turn on/off flag to control whether data is rendered using immediate mode or not. Immediate mode rendering tends to be slower but it can handle larger datasets. If you are having problems rendering a large dataset you might want to consider using immediate mode rendering. ExplicitBackfaceProperty Will assign BackfaceProperty=FrontFace for modelSliceX, modelSliceY, modelSliceZ, model, sliceZ, sliceY, sliceX, isosurface, surface; It is used to resolve rendering issues on (very few) systems rendering only one side of surfaces. (See workaround in FAQ too). DesiredFlyToSeconds Define the time used for animating to the particular isometry applied. Default: 2 seconds (Range: 0 - 100). Remark: Actual number of frames shown during the animation results automatically from current rendering time. Rendering time depends highly on the object complexity and its current transform and varies during the animation - faster 3D graphics systems will show more animated frames thus the resulting move will look natural. DesiredUpdateRate Desired number of frames per second while the 3D view is rotated or zoomed with the mouse interactor. Remark: Setting InteractorDesiredUpdateRate to 0.0001 will practically turn the LOD functionality off (full detailed image on each rendering). StillUpdateRate Number of frames per second while the 3D view has became still after being rotated or zoomed with the mouse interactor. Default: 0.0001 fps (Range: 0.0001-10000). It shall always be smaller then the DesiredUpdateRate. TubeNumberOfSides Number of sides of the Tube representation (Streamlines, Isolines). Remark: After changing this setting you will eventually have to restart the visualization. ConeResolution Number of facets used to represent the cone (as used by Vectors/HedgeHog). =0: a line; =1: a single triangle; =2, two crossed triangles; >2, a 3D cone (with resolution number of sides). ConeRadiusToLengthRatio The radius of the cone base as ratio of its length (as used by Vectors/HedgeHog). 0.15 ~three times long as wide; 0.25 twice longer as wide. ArrowResolution Number of facets used to represent the arrow shaft and its tip (as used by Vectors/HedgeHog). =1: a single triangle and single rectangle; =2: two crossed triangles and single rectangle; >2: a 3D tip cone and 3D shaft (with resolution number of sides). ArrowTipRadiusToLengthRatio The radius of the arrow's tip cone base as ratio of arrow length (as used by Vectors/HedgeHog). ArrowShaftRadiusToLengthRatio The radius of the arrow's shaft as ratio of arrow length (as used by Vectors/HedgeHog). ArrowTipLengthToLengthRatio The length of the arrow's tip cone as ratio of arrow length (as used by Vectors/HedgeHog). StereoAnaglyphColorSaturation The anaglyph color saturation factor (as used by anaglyph stereo rendering mode). 0.0 means that no color from the original object is maintained, 1.0 means all of the color is maintained. The default value is 0.65. Too much saturation can produce uncomfortable 3D viewing because anaglyphs also use color to encode 3D. StereoAnaglyphColorMask The anaglyph color mask values are two numbers which are bits mask that control which color channels of the original stereo images are used to produce the final anaglyph image (as used by anaglyph stereo rendering mode). The first value is the color mask for the left view, the second the mask for the right view. If a bit in the mask is on for a particular color for a view, that color is passed on to the final view; if it is not set, that channel for that view is ignored. The bits are arranged as r, g, and b, so r = 4, g = 2, and b = 1. By default, the first value (the left view) is set to 4, and the second value is set to 3. That means that the red output channel comes from the left view, and the green and blue values come from the right view. Window Warning and error messages of visualization components will be displayed (a dedicated window will be exposed). 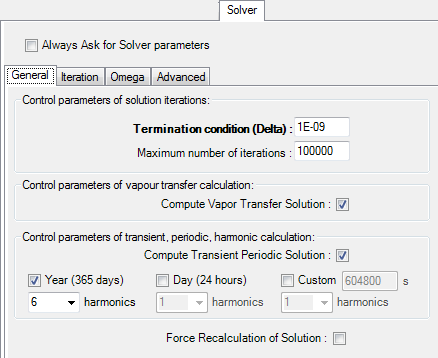 Compute Vapour Transfer Solution inquiry Always ask if Solver shall create the solution for the vapour transfer problem provided the sufficient data is available but this Computation has not been requested yet. This setting is subject to additional licence restrictions if such apply. Compute Transient Solution inquiry Always ask if Solver shall create the solution for the transient periodic, harmonic, instationary problem provided the sufficient data is available but this Computation has not been requested yet. Hint: To restore the value of any respective parameter to its default use its context menu (right mouse button) and select "Reset". Remark: Application wide settings are stored to the file AnTherm.exe.Settings.xml which is kept within local settings folder of any user. The lately active tab of the settings window will be save with the application settings and later restored (LastSelectedApplicationSettingsFormTabPageName). You can Drag & Drop a file onto the surface of this control too.